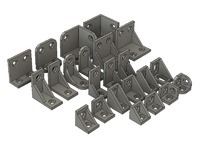 M-shaped Filament clip, 1.75 and 3 mm versions by bneedhamia is licensed under the Creative Commons - Attribution license. 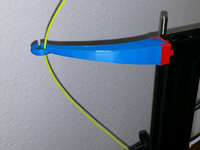 Keep your filament from tangling with this little clip. I found my previous clip design, which clipped to the reel, kept being pushed off as I shuffled reels of filament around in their storage bin. 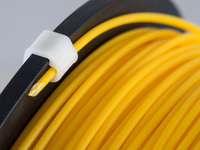 This design clips the filament to itself, making it far less likely to fall off in use. Unlike some other filament clips, that hang on the reel when not in use, this one holds both the filament loop and filament end firmly. I've printed the 1.75 mm version in PETG on the Prusa, just because I was at the end of a reel of PETG. I printed the 3 mm version on a Lulzbot Mini in PLA, at the default layer height.  To clip to the filament: press one end of the M-shaped clip onto the end of the filament, then press the other end of the clip onto a loop of filament on the same reel. That way the clip keeps the end of the filament from slipping under some other part of the filament, avoiding tangles later on. The FCStd files are the FreeCAD source for the two sizes of clips. It's actually a single design, where I changed the gap size to fit the different sizes of filament. The clip gap is slightly smaller than the filament size, so the clip is always pressing on the filament. The little bulb on the end keeps the filament from slipping out the end of the clip. The chamfer makes the clip feel better, but also makes it easier to pop the prints off the bed with a spatula.